Happy Easter! So thankful that today actually feels like Easter – warm and sunny! And we’ve been able to enjoy the day with family and friends. Really a perfect day. Bubbles had a wonderful morning of chasing down eggs and opening treats. Then we had lunch, where one of Ashley’s friends from college declared my White Cheddar Mac & Cheese (no chicken or broccoli today) the best food on Earth. Yeah, that will make you smile. Now something to make all of you smile! You may or may not be aware that Pixar is kind of famous for “Easter Eggs” in their movies – a character or item from one will end in another in a really small way. Disney does it, too, like when Rapunzel and Flynn show up in Frozen (see above!). The above clip is from Pixar Easter Egg Hunt, which can be found exclusively in the Discover section of Disney Movies Anywhere, Disney’s all-new, cloud-based digital movie service. We’ve been using Disney Movies Anywhere with our Apple TV and we LOVE it. You can connect your iTunes account with your Disney Movie Rewards account, and all the movies you’ve redeemed the digital version of will show up over on the DMA app. So cool. 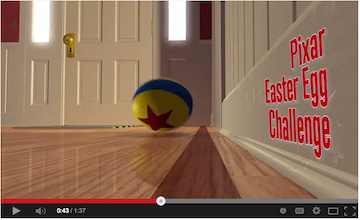 What’s your favorite of the Pixar Easter Eggs?